App Builder Appy Pie: The world of mobile technology, especially the mobile apps are evolving forever at a rapid pace and if you are in this business, you have to stay ahead of your competition by keeping abreast of the latest trends in mobile app design. More and more small businesses today are opting to build their own apps for their businesses. Your mobile app design must be in accordance with the latest trends in mobile app design if you are to stay on top of your business and cast a favorable impact on the app users. The user experience that your app offers goes a long way in building success into your app and your business. This is what is going to help you convert the app users into customers. In any of the aspects of the app whether it is the navigation, hierarchy, images, downloading or any other detail within the app, if there are any hiccups or problems, making the user experience poor, people would be discouraged from putting in any kind of money within your app. When your app is unable to drive much traffic, the fault might lie in its inability to offer an exemplary user experience. This might be due to an outdated app design, lack of certain features, or for any other reason that your app is not really meeting the expectations of the app users. One important thing to remember is that the requirements of businesses and the expectations of the customers keep changing, hence mobile app designers need to come up with new solutions to meet these new requirements & expectations. The overall focus for both, the designers and the mobile app designers is always on making the apps more and more user-friendly. With each passing year there is an emergence of new ways to integrate buttons for navigation, and other such features. An app that fails to keep itself updated and in touch with the latest developments and the latest trends of the trade is not going to go far. Not only would an outdated app face compatibility issues with the newer devices, but also fail to impress the app users. The app users today are highly evolved and have high expectations from any new product that they choose to use, and mobile apps are no exception. Only when your mobile app offers the most intuitive, latest, and most identifiable features would you be able to reach the right kind of audience and then convert them into customers. This year there are certain trends which have become the working rules or guidelines this year which may help the mobile app designers today stay in the game and promote their business growth. Let’s take a look at it all, shall we? The phones today are turning into mobile devices that are basically taking over our entire lives and helping us add convenience and luxury to our mundane lives. As more and more functionalities and features are getting included into the mobile phones and there are apps for almost everything, the screen sizes of these devices are getting bigger as well. The bigger screens accommodate more visual content and hence the design of the new age apps are also getting influenced by this sensibility. As smartphones are getting bigger and phablets are getting more and more popular, the designers too need to understand the need to take this factor into consideration. It is predicted that the phablet market this year is going to grow by a whopping 36% as compared to just 4% growth in the smaller smartphones market. Though using a device with a larger mobile screen might be fun to use and interact with, but it also has its own challenges. To design for the bigger screens, it is required to make certain changes in the UI/UX navigation of the app. One more thing that needs to be remembered while designing the mobile apps for bigger screens is that it is only about one fourth of the screen that can be reached with the thumb of the user. Hence, when the designers are designing for a bigger screen, there are a whole lot of factors that need to be tweaked or redesigned, which can come as quite a challenge. Personalization has been a trend for quite a few years now, but this year it would be taken several notches up as personalized User Experience is going to be one of the hottest trends of the year in the world of mobile app design. Since the trend has been around for some time now, it has been maturing and evolving and the app users today have come to expect greater levels of personalization in the User Interface and User Experience offered by a mobile app. The whole point of using an app is going ‘Mobile’ which means you would be carrying the device in your pocket and use the app whenever you want to, from wherever you want to. This is why the apps have an opportunity to make use of location data in order to provide content to the user which will be relevant to their current location. In this manner, the services you provide would become more responsive to the environments around them. This is one of the features that made the Starbucks app wildly popular as they provided location specific deals and discounts to their app users egging them on to convert faster and be retained for longer. This year go nuts on this feature and you would emerge as a leader with an app that is “in” with the latest trends in Mobile App Design. However, personalization in context of mobile apps is not limited to just the content on the app and has a much larger scope. Take, for example the scenario where your app users may be suffering from poor eyesight, or may even be colorblind, would they be able to use your app as easily as someone with normal eyesight. When we are talking about personalization this year, we are also talking about adapting or tweaking the layout to suit a person. This personalization can be accomplished by making use of all the information that the user has made available to you and combining this information with the sensors on the device that the app is being used on. it can even help you track how the users are interacting with the app and the problems that they are facing while using the app. This information then can be used by the app, in determining whether there is a need for change in the font size, or whether there is a need for the audio levels to be turned up whenever a video is played. One of the most difficult things to achieve is a simple design. Today, the designers are doing everything they can do in order to create a simplified user interface. It is important to understand that the user interface on an app needs to be as simple and clear as possible for smoother and effective functionality. Currently most of the UI designs are flat designs in order to better suit the digital screens. Appy Pie has listed some salient features when it comes to building a simplified User Interface, take a look! Simplicity must be implemented consciously in all aspects of design whether it is UI, graphics, logo, or even the splash screen of your app. Voice search is the future as more and more people are resorting to voice search as they go looking for anything that they might need. Voice enabled functions help your app users accomplish more in a shorter time and can even make matters simpler for those who have poor vision. Voice search can help your app users find directions to your place of business without having to park on the side of the road as they tap and type on your app or help them order their favorite product without the fear of misspelling the name or brand and not being able to find it, or even accomplish tasks when they literally have their hands full. Hence while designing a mobile app yourself or getting it designed by a professional, it is important to incorporate voice enabled functionalities, particularly for the more popular features or tasks that are accomplished with the app. One of the hottest trends that have made their way to this list is creating navigation buttons that are easy but highly creative too! One of the most important part of the app experience is the experience of navigating within the app, especially when you are a new user. It has become clear today, that for an app to be successful it has to have a clear navigation which is intuitive and easy even for a first-time app user. There are some precisely defined salient features of this design trend, and here’s the list! Offering multiple & innovative navigation options within the app which includes vertical, modular & horizontal, hidden navigation, and parallax scrolling. Creative and convenient ways of implementing a navigational button that comes on to the screen for a limited amount of time and vanishes if no action is taken for a certain amount of time. Rows of information offered to the app users by way of modular scrolling. For mobile apps that are content or information heavy, having an infinite scrolling is a great way to offer a more satisfying user interface. One of the best ways to facilitate intuitive navigation is Parallax scrolling. One of the most liberating trends today is that of going cashless. This, in fact has quickly turned into a whole new standard expected by the average user today. This mode of payment has even emerged as one of the favored modes of payment for a great number of people and the number of people trying it out almost doubled last year (2017)! The power of this trend is only exhibited by realizing the kind of impact and transformation it has brought in the daily commerce. China, for example where the number and percentage of users is significantly high, the most favored way of payment turns out to be – cashless payment. This is a big indication for all the app owners, appreneurs, and app designers that tells them to offer within the app, Apple Pay or Android Pay as a default payment option for all kinds of purchases they want the users to make through their apps. The convenience of going cashless is being recognized by businesses & individuals alike and mobile app designers must take this trend into consideration as they set out designing flawless new apps for their clients or even for themselves. This year when you sit down and look at your app design, make sure that you have some fresh colors on it, as it is a definitely emerging trend that is beginning to establish itself this year. In the recent past, the mobile app designers were designing the mobile apps in quite a minimalistic fashion with mild color themes while incorporating quite a lot of white space in it, to bring out a minimalistic look for the app. This year however, the aesthetics have done a big flip and have given way to light & dark backgrounds. This is in sync with the trend of using fresher and more vibrant colors in website design as well. Optimum use of blank space is still quite important, but the addition of a background color gives the whole aesthetics a noticeable pop. When it comes to the creative design aspect of the mobile apps that are being developed in the recent times, one of the emerging key players is the typography. In the past, typography has somehow been playing second fiddle to other prominent design elements like colors, navigation etc. but now things seem to be taking a different shape altogether. Now the emphasis is shifting and leaning more towards the use of scalable typography and this is also egged on by the recent Apple launch of iOS & Helvetica Neue. As more and more new apps are getting designed, scalable typography has assumed the position of a key feature in Mobile app design. This trend is also evident as recently, Apple created and launched San Francisco – a new typeface that they have especially created for their Apple watch apps. In addition to the typography being scalable, it will also cast its own impact on the way the whole interface and the overall design of the app appears to the app users. The scalable typefaces coming up today have a good amount of negative space while still being bold & big! If you were to take a peek into a designer’s toolkit, the most powerful and the most effective tool would be – color. Colors have the ability to attract the attention of the users, set a favorable mood and influence the emotions & behavior of the user. Today mobile app design is seeing the use of a great number of vibrant colors. According to the trends and the impact that a color can have on the user’s emotions, and elicit a series of favorable actions, even turning a casual app user into a customer. This year colors have evolved in their role in design as they are graduating from being a mere aesthetic element and are becoming more functional in their attributes. Each color that appears on the app would have a symbolic significance in its core function. For example, the designers may be looking at assigning different colors to different categories of notifications or sections within the app, so that colors act as distinguishers of a sort, making the app experience more evolved & lucid. As the year progresses, there is an increase in the extent to which emotional intelligence is being integrated into the whole mobile experience. There was a time when emotional intelligence was just about offering some sort of animated effects as soon as the app users would complete certain pre-specified actions within the app, however things now have changed, and emotional intelligence has greatly evolved. Today emotional intelligence is being explored intensively and is being leveraged quite smartly with the objective to make the entire app experience a lot more engaging and rewarding. There is a whole lot that the written word can accomplish, but the human nature and need to express and emote is sometimes not meant entirely with just words. Remember when the command string interfaces were doing the job of emoting, we still demanded and receive emoticons in order to help people understand exactly what we were feeling. This is an era of mobile devices and you know that if you weren’t living under a rock all these years. The mobile devices afford us an ability to use a much broader range of emotions. Face recognition can in fact be leveraged to offer a lot many more relevant reactions. The Animojis or the animated emojis that respond to the facial expressions when used on the camera of iPhone X, have emerged as a great application of this concept. 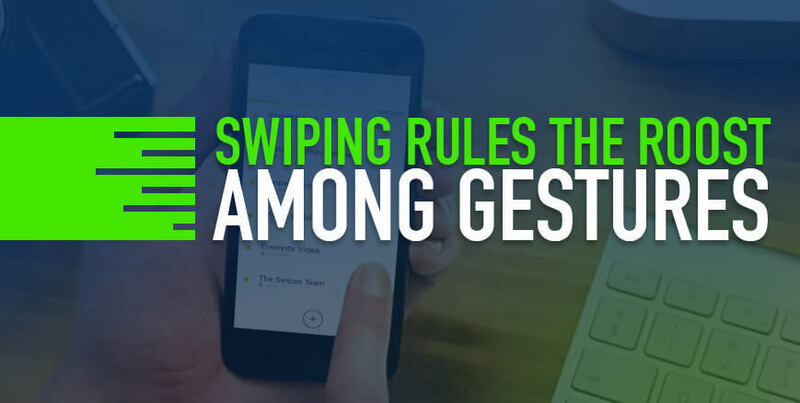 A greater emphasis is being levied on the gestures that are used on the mobile apps, and this will, in turn change the way we interact with the apps. As an example, consider the situation where you want to ‘like’ some content. Currently what we do is tap on the icon or button, but now we would be able to do this through a natural gesture of maybe drawing a ‘heart’ or tick mark on the screen. The thing about humans is that they tend to form an emotional connect with everyone, and every product that they interact with. Hence, it is only natural that they have come to expect a human touch to the feedback process while using the product. We are, of course, aware that the products we are using are inanimate and do not have feelings, but we tend to want to believe that they do, in our attempts to create these connections. A trend that is being talked about a lot and has managed to find its application in a great number of fields – Augmented Reality has also managed to change the way any user sees the app and the way they see them. It has only been a year when Mark Zuckerberg predicted that the screens everywhere would eventually be replaced by lenses. And as the year 2018 is quickly proving to be the year of augmented reality, we are witnessing a great number of people using their mobile phones or other mobile devices as a lens to peek into the virtual world. Augmented Reality is a big trend in the context of mobile app development & design and there is a good number of apps that have managed to incorporate the technology in varying degrees and type. However, creating an app based on augmented reality was not really an easy task to accomplish and entailed a learning curve and struggles with the existing loopholes in the technology due to its comparative nascence. This issue was taken care of last year, in 2017, when both the leading app stores Google & Apple launched structured frameworks for augmented reality and have managed to ease out the whole process considerably. This means a great use and emergence of apps that extensively harness this technology and offer innovative features and experiences to the app users. A great number of people of this generation were introduced to the concept of augmented reality being integrated into an app. This, in fact is one of the most effective examples of demonstrating how augmented reality can be used in apps for a greater entertainment value. Though this is one of the most popular examples of using augmented reality for entertainment, let us not make the mistake of assuming that by entertainment we only mean gaming! Augmented reality lenses have also been incorporated in many messaging apps in order to make them a lot more engaging while giving the users a reason to come back for more. 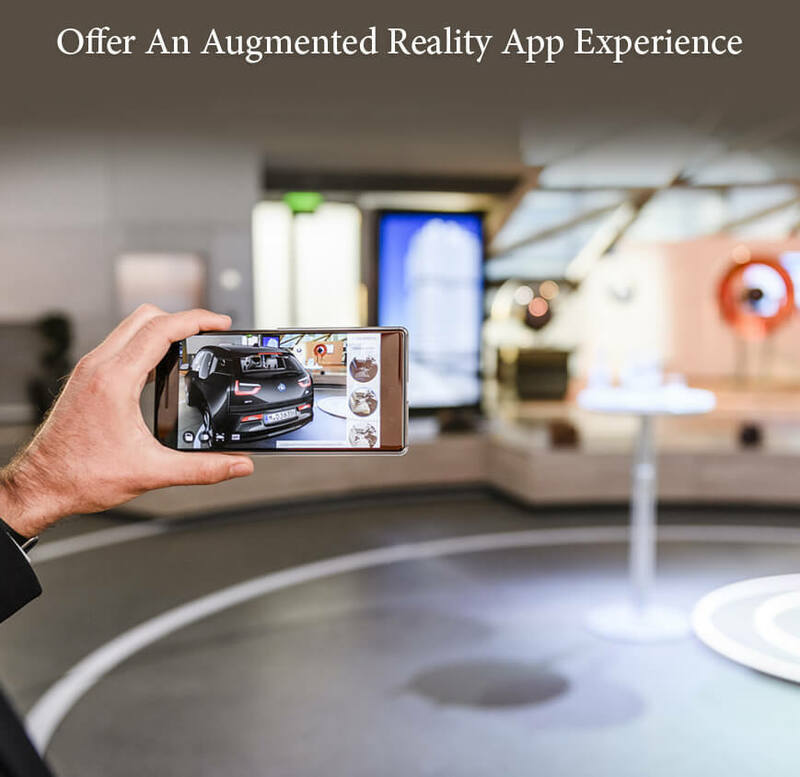 The use of augmented reality in mobile apps was brought to the public eye with its application in various modes of entertainment including gaming, chatting, videos, and other such media. However, the application of this new age technology is far from limited to this one field only. There are some very real and very useful applications of augmented reality that solve real problems while delivering to the users some real value. For example, there are tutorials equipped with augmented reality features that make it easier for the app users to follow through actions like repairing a tap in the real world! Another example of this would be AR Measure that lets you measure objects in the real world without a traditional physical measurement tape. All that jazz and aesthetics of your new mobile app is great, the colors are pretty, typography looks brilliant too, and the navigation is fairly intuitive. This would definitely ensure that the onboarding experience of every app user is exemplary. However, if you do not have relatable and valuable content to offer to the app users, it would be unrealistic for you to expect the app users to come back to use the app once more. The content provided through the app must be appropriately curated to suit the taste of the target users and should also be easily accessible. If the users have to struggle with the app to get to the real content, not many would be intrigued or captivated by all the other efforts you made for it. One of the most effective ways to keep the content at the front and center is by decluttering. What it essentially means is that you can consciously remove any kind of visual clutter in the app and thus improve comprehension. This, in fact is one of the most popular User Experience goals among mobile app designers today. It has become an assumed responsibility of the mobile app designers today to remove any irrelevant information that might have been creating ‘noise’ in the design. In doing so, you can prioritize only the relevant information because you are effectively putting content first and elaborating a lucid visual language. Once you have gotten rid of all the visual clutter, you can go on to focus on the real message that you intend to proliferate through the app. This is one of the most effective techniques to make the content more comprehendible and relatable. Develop a distinct order of showcasing the different UI elements, so that the users can better relate to the content on the app. This can be done by making use of effective visual signifiers like, for example making use of contrasting colors for call-to-action buttons when you want to direct the users on certain elements, buttons, actions, or essential pieces of information. Traditionally the logging in process into the app can prove to be tedious and sometimes discourage the app users from further using the app. This tedious process can be bypassed if the app were to make use of a biometric authentication. In this way, all you need is a certain unique physiological or behavioral trait specified in the app and can be anything from fingerprints, to facial recognition or voice recognition. Biometric authentication or authorization is not exactly a brand-new technology, it has, in fact been around for some time now. 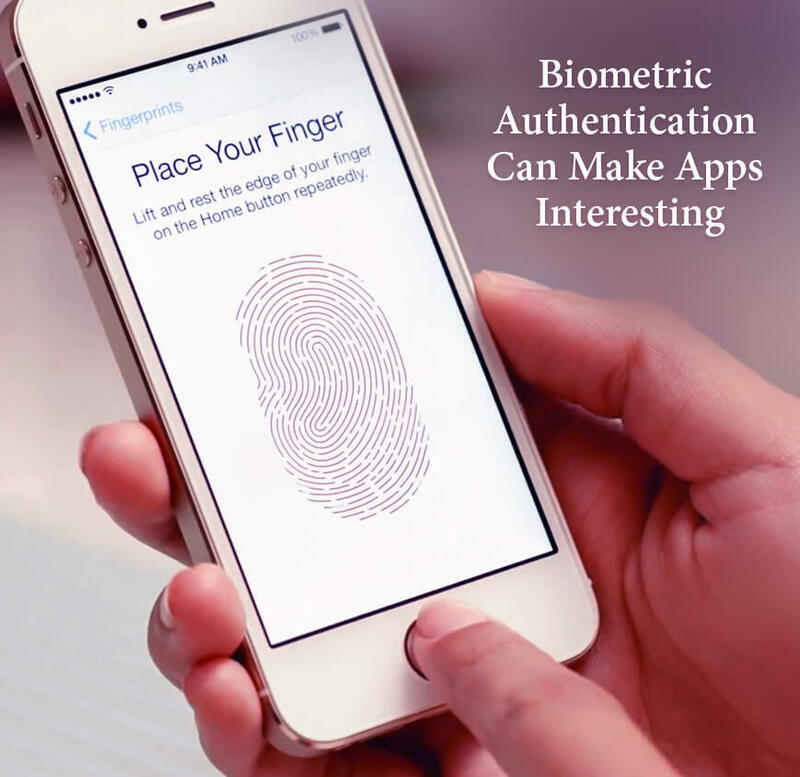 The technology has caught on and gained popularity to the extent that today, quite a few app users are using biometric authentication instead of passwords. This statement can be further demonstrated by the fact that an average iPhone user unlocks their device for about 80 times a day and about 89% of the total number of users make use of their touch ID for this. It is clear that this year the trend is getting stronger, as biometrics will become more accessible leading to greater use of biometrics for authentication and for the purpose of identity management. This is one of the ways to make the apps secure for all the end-users of the app, and for the businesses as well. Facial recognition has been how we have been recognizing all other people in our contact, & now machines precisely the mobile devices and mobile apps too are learning to recognize the users through their most defining feature that is their face. iPhone X has incorporated Face ID, giving the users an opportunity to use one of the most natural ways of being recognized. Developing mobile apps for business is not a novel idea, and with time, the concept is only digging deeper roots. Today, there is a strong need for the brands or companies to recognize and understand that the mobile apps are one of the strongest ways to create a positive relationship with the customers that would last for a long time. One of the most important things that the mobile app designers and the app owners must consider seriously is to design a mobile app in such a way that it has the ability to tell its own brand story. Telling a strong story about your brand helps the app users identify you and connect with you without getting confused or distracted by a million other apps that might look alike! Building a customized app experience to be delivered to the app user. As the competition rises, there is a strong need for brands and mobile apps to carve out a position for themselves and etch themselves in the memories of the app users. Hence this year has been witnessing a stronger emphasis on branding and storytelling from the design perspective when it comes to building mobile apps for business. Last year (2017) we saw that videos gained a great popularity and this unique format of content marketing emerged rapidly into a position of prominence. These statistics, though not really shocking, clearly indicate the importance this medium holds as a marketing strategy. The average user today is overloaded with information and is being bombarded with fresh content frequently. The users are forever looking for something new and have low patience. It is important to keep adapting to the changes in human behavior that new ways of content delivery have appeared on the horizon. Two of the most brilliant of these adaptations are videos in the 360-degree format and Facebook Live that suited this trend quite optimally. This year has already been witnessing an adoption of this trend quite dominantly as more and more users and businesses make use of this format in order to deliver critical information in a timely and appealing manner. It has been observed that most of the mobile phone users tend to hold their phones in the portrait mode for most of the task. Since most of the tasks on the mobile phone are compatible with the portrait mode, the mobile phone users are used to this orientation. This is why all the content, including all the videos must be adapted to suit this orientation and make it easier for the average user to benefit from the content. The journey of the user within the app is of great importance. It is important to remember that whenever an app user would be using your app, they would do so with a particular goal in mind, whether it is making a purchase, reaching favored content, or organizing thoughts & ideas. For an app user, it is important that the time they spend in reaching this goal is as little as possible. In fact, the amount of time spent by the user in reaching their goal is of critical importance when it comes to making the app experience exemplary for the user. 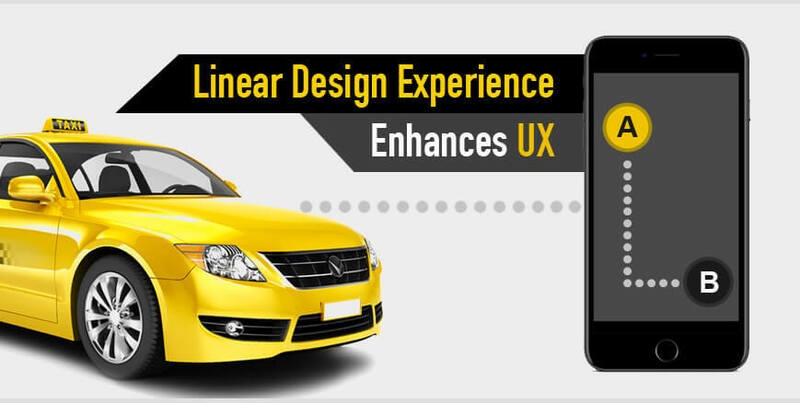 What we mean by Linear Design Experience is a User Experience that has a particularly clear beginning, middle, and end which allows the app users to complete one, single action at each step without distracting or confuse them. When the user flow is designed to be linear, it is easier for the users to have an estimation of the total amount of time that would have to be spent in completing a task. This kind of Linear Design Experience is exemplified by the leading taxi booking app Uber, where the user journey is linear and comprehendible. At every step, the users are aware of what to expect next, and how many more steps they’d have to take before they can reach their goal, that is booking a taxi. There are some apps, where there is a need for a whole lot of information and actions that the app users might have to wade through, at different times in different scenarios, which means there isn’t any need to display or disclose all of that in one go! This is where a special technique called Progressive Disclosure comes in handy for the designers. This means that at any point in time, only that information or action is visible which the user needs at that particular time. This technique helps reduce the possibility of cognitive overload and thus enhances the over all comprehension & ease of use of the interface. The new generation devices and apps are expanding the use of screen pixels and with the recent launch of Samsung Galaxy S8 and iPhone X the frameless design became an established trend. With this trend, designers have, at their disposal a lot more screen space that they can use to offer unique and enhanced app experiences to the app users. The use of full screen is something that the app users this year have come to expect from a truly flawless app and when you are designing an app this year, consider this trend quite seriously. As much as the users are looking forward to an exemplary full screen experience, they demand a great quality of images, visuals, or any other kind of content that is put on the app. Hence, the quality of visual or any other content that you choose to place on your app must be of a high quality. The quality of the visuals would definitely have a huge impact on the app experience and on the expectations the users have from your app. Putting up an image that is pixelated is a cardinal sin today. This is a real thing, and quite an important one at that! In this day and age, people who are mostly isolated for most part of their day, are in love with ‘chatting’. It is to satisfy the love people have for chatting that the technological world has brought about the emergence of chatbots & voice-activated assistants. These chatbots are today powered by another hot technology trend i.e. Artificial Intelligence. Building an integrated chatbot assistant into the messaging platforms would bring about a new face to the customer relationship or customer care. Currently, these assistant chatbots may not be able to entirely replace the traditional experience of Graphical User Interface, but there would be an increase in the number of chatbot assistants’ integration in the messaging platforms for business, for example in Facebook Messages. What this means is that the modern-day businesses would be able to hold entire conversations with the users or clients through the use of automated chatbot assistants. The extent of benefits that this can bring to the businesses is paramount as the level of customer service would definitely go up manifold. Today, as more and more unique and evolved technological advancements are taking on the world of mobile apps, there are a number of highly evolved ways of interacting with an app, that go beyond the graphical user interfaces. In recent times there has been a significant progress in natural language processing & computational power which has led to the emergence of voice-based interfaces. This is clearly indicative of an emerging trend of ‘Voice-Activated Interfaces’ as the next big-thing for the coming years. When people are using a voice-activated interface, the need to type everything out has been eliminated, which in turn enhances the whole user experience and eliminates a potential source of friction for app users. As conversational interfaces rise in popularity and an increasing number of designers and developers are working to integrate them into the apps today, there is an increased awareness about the importance of copywriting for such interfaces. This is because the chatbots are almost entirely dependent on an exchange of words between the mobile app user and the machine. Hence, every word is of great significance and needs to be chosen carefully. We have been swiping right & left, up & down, all through the last year, maybe longer (circa Tinder! ), but this year, this trend is something to watch out for as the swipe features sees considerable improvement. Look for inspiration in the card-based feeds in Pinterest board & Twitter. Offering clarity regarding the kind of interactions that are available within the app. This concludes the list of mobile app design trends that we came up with. Treat this list of trends as your middle of the year guide for mobile app design trends and you would see your design of the mobile app emerging as a great success! Did we miss out on anything here? Do you know of any other trend that you have been witnessing? Let us know in our comments section!